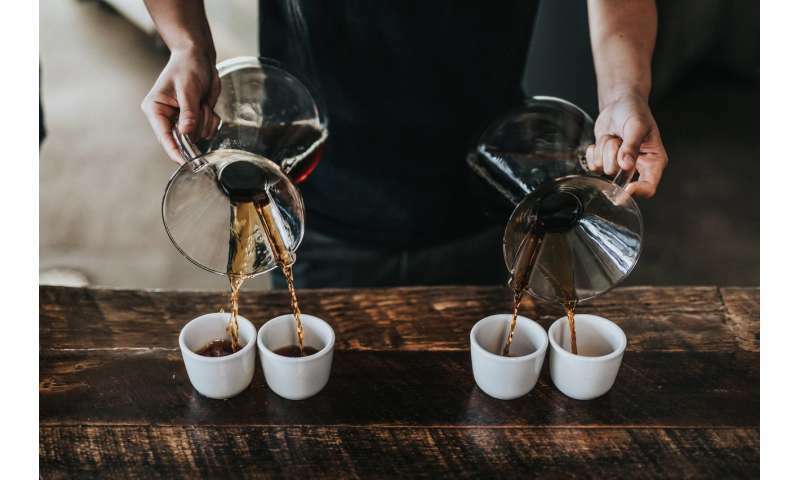 Caffeine consumption has been associated with lower risks for multiple diseases, including type II diabetes, heart disease, and stroke, but the mechanism underlying these protective effects has been unclear. A new study now shows that caffeine promotes the movement of a regulatory protein into mitochondria, enhancing their function and protecting cardiovascular cells from damage. The work, publishing 21 June in the open access journal PLOS Biology, by Judith Haendeler and Joachim Altschmied of the Medical Faculty, Heinrich-Heine-University and the IUF-Leibniz Research Institute for Environmental Medicine in Duesseldorf, Germany, and colleagues, found that the protective effect was reached at a concentration equivalent to consumption of four cups of coffee, suggesting the effect may be physiologically relevant. The authors have previously shown that at physiologically relevant concentrations (i.e. levels reached after four or more cups of coffee) caffeine improved the functional capacity of endothelial cells, which line the interior of blood vessels, and that the effect involved mitochondria, the cell's energy powerhouses. Here, they showed that a protein called p27, known mainly as an inhibitor of the cell cycle, was present in mitochondria in the major cell types of the heart. In these cells, mitochondrial p27 promoted migration of endothelial cells, protected heart muscle cells from cell death, and triggered the conversion of fibroblasts into cells containing contractile fibers—all crucial for repair of heart muscle after myocardial infarction. They found that caffeine induced the movement of p27 into mitochondria, setting off this beneficial chain of events, and did so at a concentration that is reached in humans by drinking four cups of coffee. Caffeine was protective against heart damage in pre-diabetic, obese mice, and in aged mice. "Our results indicate a new mode of action for caffeine," said Haendeler, "one that promotes protection and repair of heart muscle through the action of mitochondrial p27. These results should lead to better strategies for protecting heart muscle from damage, including consideration of coffee consumption or caffeine as an additional dietary factor in the elderly population. Furthermore, enhancing mitochondrial p27 could serve as a potential therapeutic strategy not only in cardiovascular diseases but also in improving healthspan." Only if you survive a heart attack from so much caffeine. "Be Still My Foolish Heart!" I wonder if this research was instigated by toilet paper manufacturers? The adverse effects of Coffee are only felt by the people who aren't used to serious amounts of the stuff. I'm already way above my 4th, so that I assume I'm going to become immortal.